It happens to the best of us: You’re about to put on a dress shirt only to realize the collar is yellow — even though you just washed it. In some cases, you may have just gotten it back from the dry cleaner after going through a wash and press shirt service. Rings around dress shirt collars have been a total pain in the neck for many men and women. However, just like any other problem we encounter, you can either react to it or you can prevent it. Before we talk about how to properly deal with yellow collar stains, we should first understand what causes it and a few key things you can do to prevent it (or reduce it). 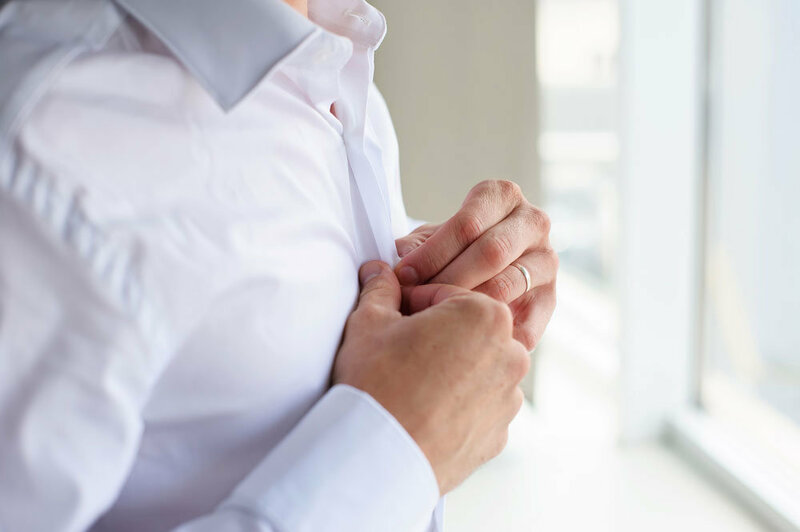 That unpleasant yellow ring on your collar is caused by sweat and a combination of dead skin cells, oils that your body produces, and product buildup. Sadly, not much can be done about sweat other than making use of body wipes on your neck throughout the day and applying a bit of (baby) powder after showering. For those struggling with a bad case of ring around the collar, adopting a few extra hygiene habits to reduce the amount of collar buildup wouldn’t hurt. Using shower sponges or washcloths in the shower are great ways to give your neck some love in the shower. Post-shower, if you’re a person who uses body lotion or hair products like gel, make sure to wipe your neck before putting on your dress shirt. This is to prevent the products from being soaked up by your collar (and your shirt’s armpit area). While wearing dress shirts multiple times between washes might be a popular thing to do for some people, it’s not the best thing to do if you want to maintain the look of your dress shirt in the long run. 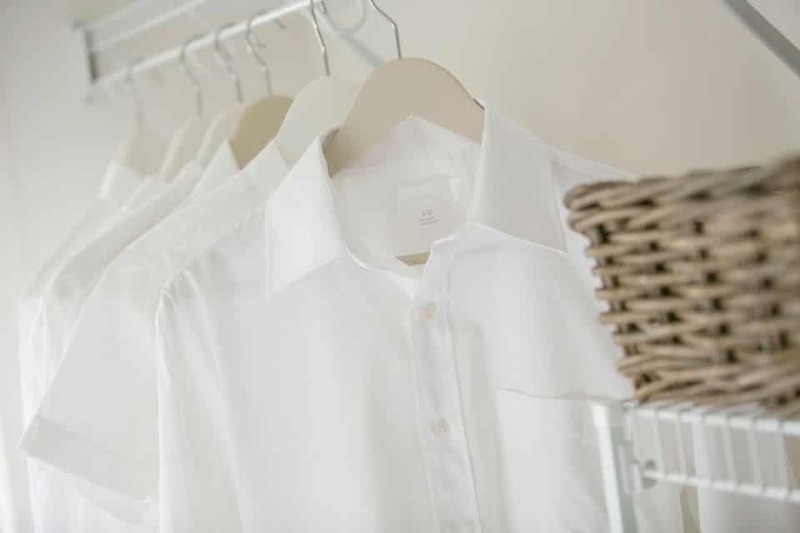 Wearing a dress shirt more than once without washing is not recommended as the body heat generated from the second wearing can set in stains from the previous wearing. The collars may even look clean at this stage but oils can appear invisible until heat is applied. If for any reason you decide to re-press a worn dress shirt for a second wearing, it’s important to keep in mind that this can and probably will cause the dirt and oils in the collar to set and become permanent stains. There are many products to treat rings around the collar nowadays. Most of them are available on almost every store shelf. However, since everyone has a different body chemistry, it’s difficult to say that there’s one specific product that will work best for everyone. The downside of these “ring around the collar treatments” is that they can actually set in the stain if not used correctly. For that reason, we recommend using an on demand dry cleaning service. A professional dry cleaner will pre-treat the ring around the collar stain with multiple formulas which will remove or lighten it. The probability of the stain setting and becoming permanent is minimized when done by professionals. *Important notice: If you’re uncertain of how to properly treat a stain, it’s best to let your dry cleaner make the first attempt. Wrongly treating a stain may in fact make it harder or even impossible for the dry cleaner to remove it after your attempt. Make sure to scrub your neck well during shower. Minimize use of body lotion or colognes around your neck. Wash your dress shirt after every wear, especially white ones. Other benefits of using a dry cleaning service and more on our blog.